I’ve got to put my new deer whistles on the car. Last week there was calamity just past the barn. I missed it all, of course. It was after dark and people in accidents no longer have to drag themselves to the door begging to use the phone. I did notice an ambulance go past but never supposed it might stop on my rural corner. Maybe it would be more fun out in the traffic. Not until my neighbour and I went for our morning hike did we see the wide bloodstain that continued in a band many yards down the centre of the road. At the abrupt end was the really big stain and the drag marks where a heavy body had been lugged across the shoulder into the ditch. Some unfortunate driver had hit a deer head on, probably at about 80 kph, in the dark. Major damage to the vehicle, no doubt. And, if the ambulance was involved, also to the driver. Deer have moved into the county in a big way. They graze with cattle, gobble up gardens, and bolt across the road before you can blink. My closest encounter was a ghostly deer face pressed against the driver’s side window in the Big Swamp at night as I missed it by a hair. The itinerant nurse who visited my old dad said she had hit six deer so far in her travels. She tossed them into the back of her pickup as bonus meat for the freezer. Deer hunting season is only a week in December, a time to watch grown men shivering for hours in sleet and wind hoping a deer will obligingly run by. 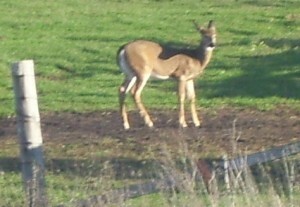 The deer go into hiding or dodge along the fence as if knowing hunters can’t take pot shots toward the road. In the summer, the Ministry of Natural Resources put up deer cameras to measure the population. Coyotes, they concluded, were taking more than their fair share of the fawns. I can see no reduction in deer tracks. So I’ll stick my deer whistles onto the bumper and acquire that peculiar high pitched screech that is supposed to repel the deer in the headlights. My humble effort to keep more blood off the road.